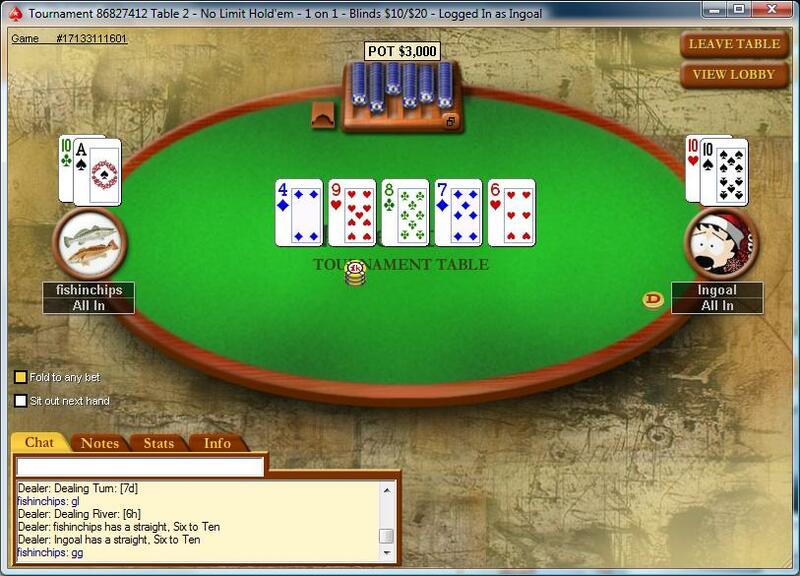 Not much play today, bank holiday today…big party yesterday evening….not really in the mood for much poker today. So I just played two 4 player HU matches…won one…lost one (after he got lucky on me thrice, but I’m not here to whine about that)…then I played a triple shootout to the sunday million. Won the first table easily…could have gone the other way though…the crucial hand was basically a cooler which ran my way on the river…three handed, preflop limp fest…I knuckle the virtual felt with 52o. 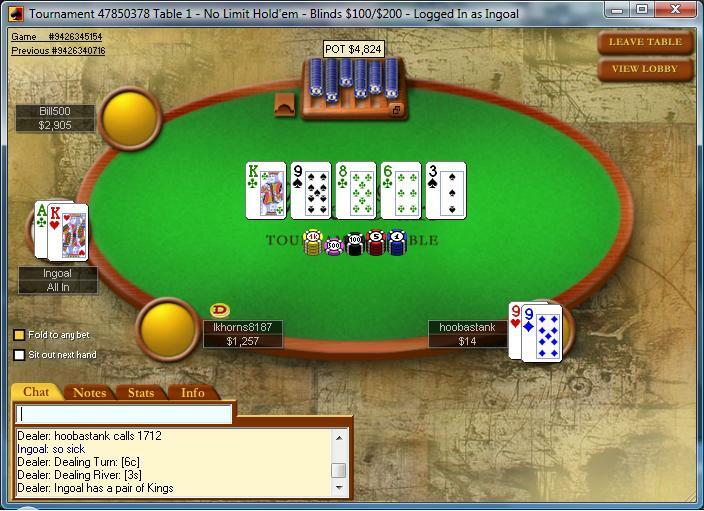 Flop comes down 543 rainbow…TP and the OESD to boot…SB leads…I call…button folds. Turn 5. Wheeee….SB leads bigger this time…I pop it…he pushes…I insta-call…he shows A5o…lol….wheeeee…not…oh well…at least I got outs (three aces and four sixes to win…three fours and three threes to chop)…river A….wheeeee…. What can I say…an interesting session today. Battled with donks back and forth and they got the best of me most of the time. Lost two headsup matches – the usual. No need to play anymore HU for the day as I can’t catch a break to save my very soul. I play a little six handed SnG trying to blow off some steam. 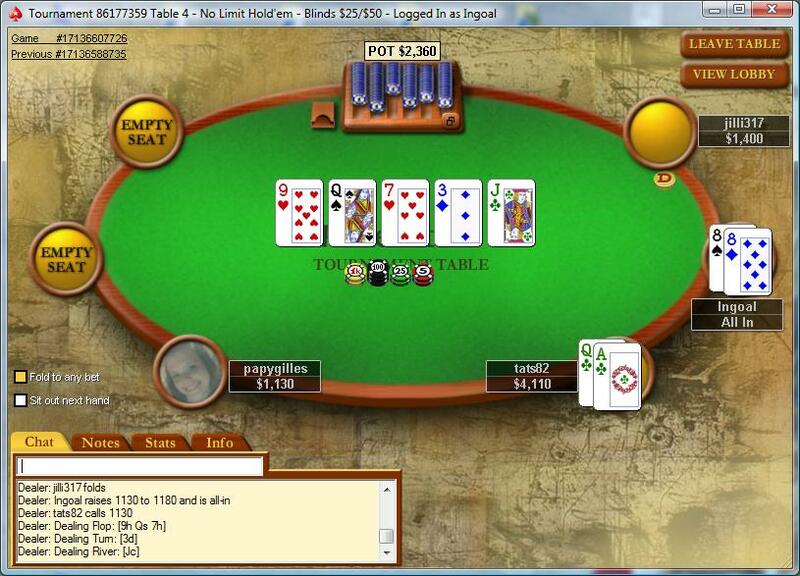 That works out pretty nicely, I get down to headsup, but I’m down 1:4 in chips. Thirty hands later I’m the winner. 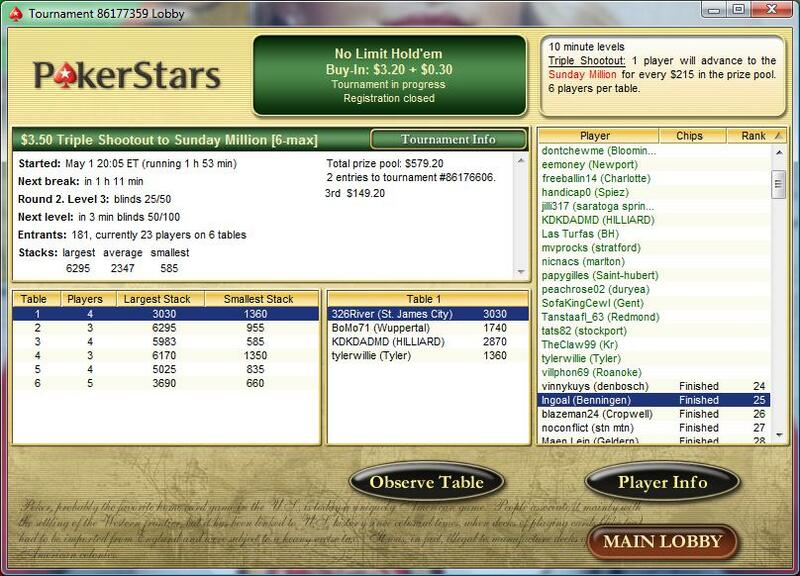 Wheee…a W.
After that, I jumped into a Triple Shootout to the sunday million. The first two tables are mostly a blur. What stood out on the second table was my headsup opponent. He took out three players (including one that took out the first player), so we went into HU with me being at 1:3 in chips. He started to bleed chips though as I made one “great call” after the other and caught him bluffing and/or overplaying his hand time and time again. 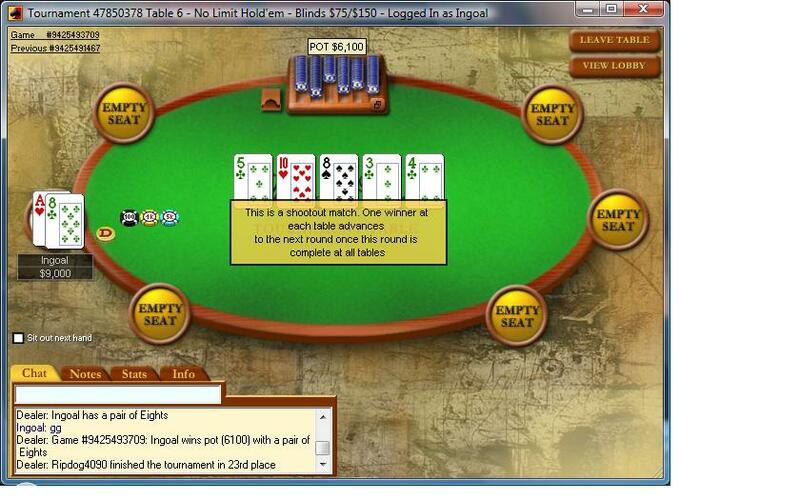 After a few short hands I was the chipleader. I had the chance to bust him when I moved in on him with A6 he calls with A4…chop…a few hands later I took him out though to advance to the finals. 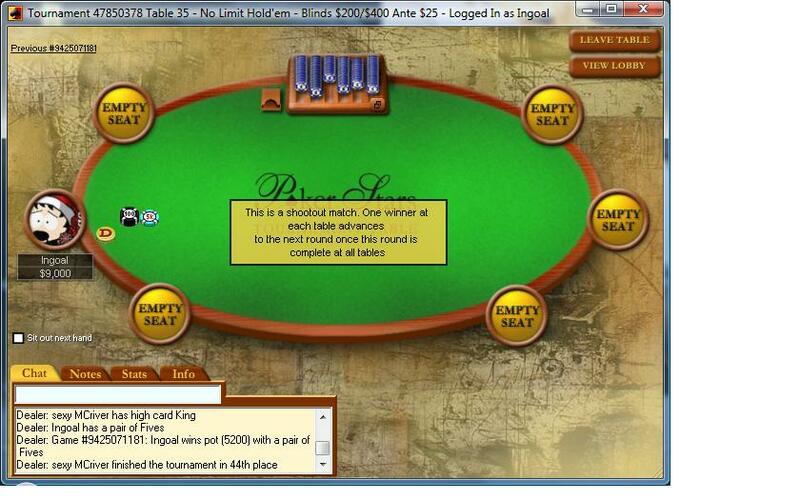 Sitting at the final table I promised myself to not get involved unless I had a monster. I kept my promise for quite a long time until one player busted and I finally started to pick up some hands. I was still down to 1k in chips and as it’s a turbo it was make or break time. I moved in with 55 and the BB called me, after some deliberation, with QJo…alrighty…let’s not get unlucky here…5 on the flop…wheeee….so I double through and pick up some pots after that. 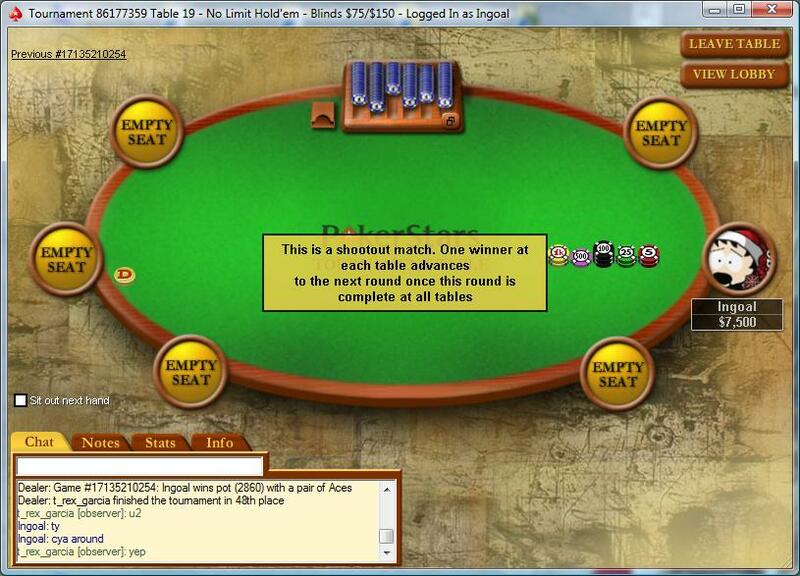 Soon enough I’m the new chipleader and I try to knock out a shorty. I raise it preflop and instead of pushing, what I hoped he’d do, he calls half his stack…so he’s basically commited…hmm….I hold KsQs…flop comes down KJT rainbow…he pushes…now I’m sitting there with an open-ender and top pair and he could have any two…so I instacall….he shows? Q9o….well played sir, but wait, there are still cards to come. turn Q….river A…chop it…I’ll take that, but how come he flops the joint with a dominated hand there, damn it…that hand comes back to haunt me later on, don’t worry. I fold fold fold and the chopbox is picking up steam, he raises relentlessly and even when he get’s called he shows up with the best hand. 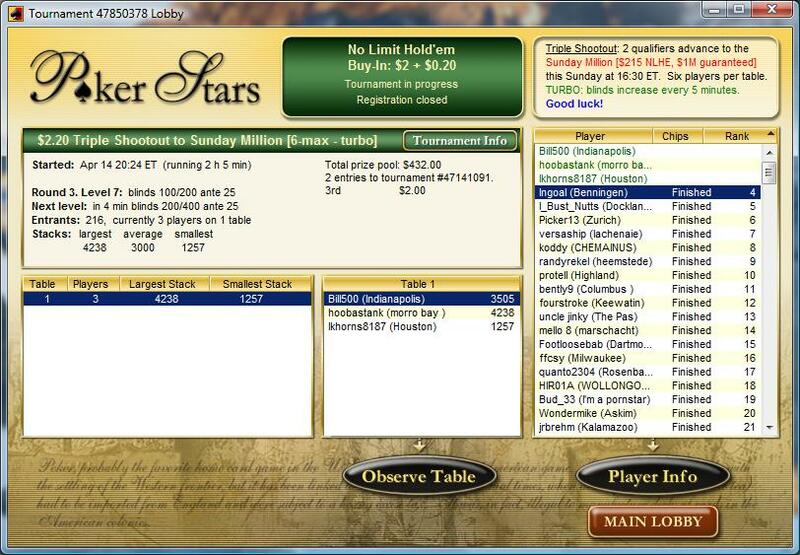 Soon enough he’s the chipleader, there’s one shorter player and I’m in third. Then the hand comes up. 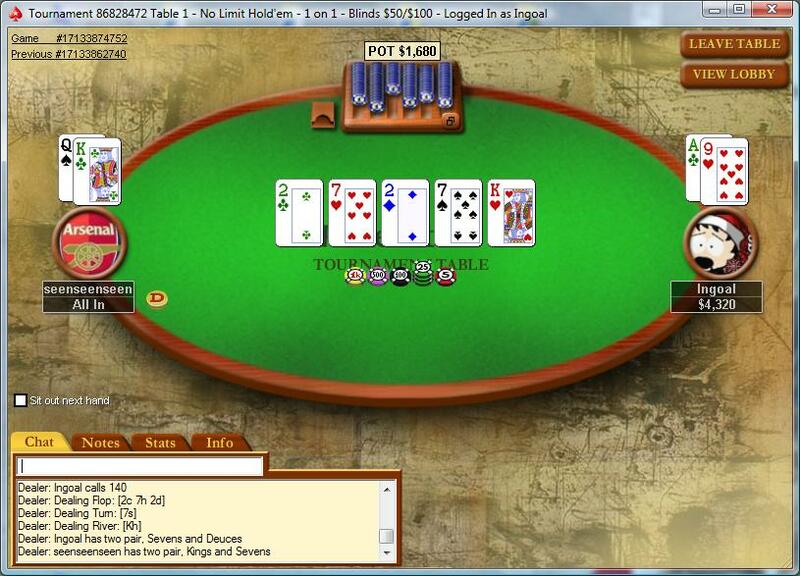 Boy, I wish I would have just folded it, lol…then again…four-handed? Who am I kidding.